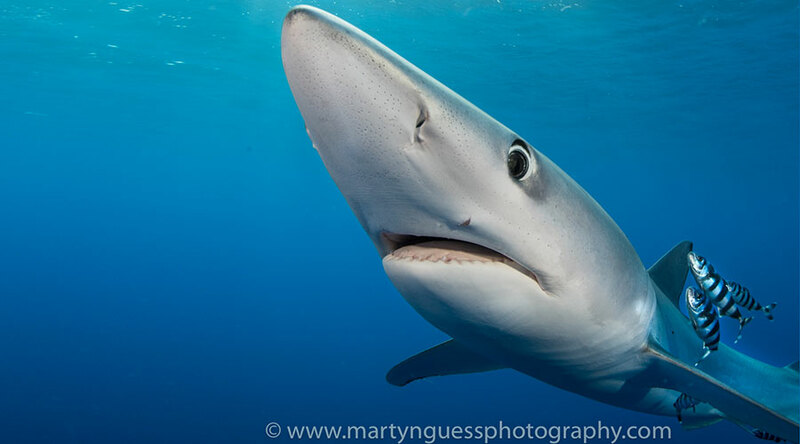 Highlights Take incredible shots of the Azores Blue Sharks with photo pro Martyn Guess PLUS stunning caverns and macro inhabitants to shoot. Including whale watching and Pico volcano, this is a photo tour with a difference in an off the path destination that is as varied as it is exciting. The Azores are not yet on the radar for many a British photographer, but for those in the know, they are the ideal place for Autumn diving. 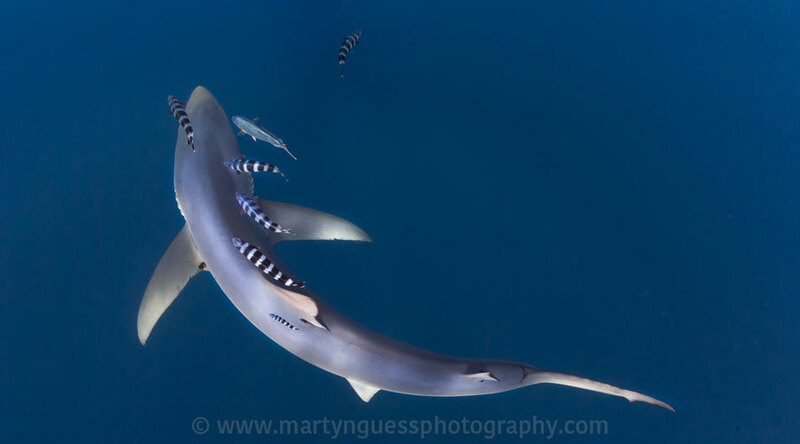 Martyn Guess will be hosting an exclusive photo workshop in 2018 on the best island for divers - Faial. Be quick: there are only 8 spots available on this dedicated tour. This is a varied photo workshop with a range of subjects - both above and below the surface! From the smallest macro nudis and crabs to the large 2m+ blue sharks, there is something here for every photographer. Martyn will be giving presentations throughout the workshop, as well as opportunity for 1:1 work on any aspect of the photography covered. Scuba Travel loyalty discounts can be applied to this workshop. This workshop has been timed carefully for the blue sharks. The water is at its warmest, and the marine life plentiful. 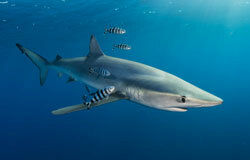 Here in the deep water between the volcanic islands the blue sharks feast on rich tuna. 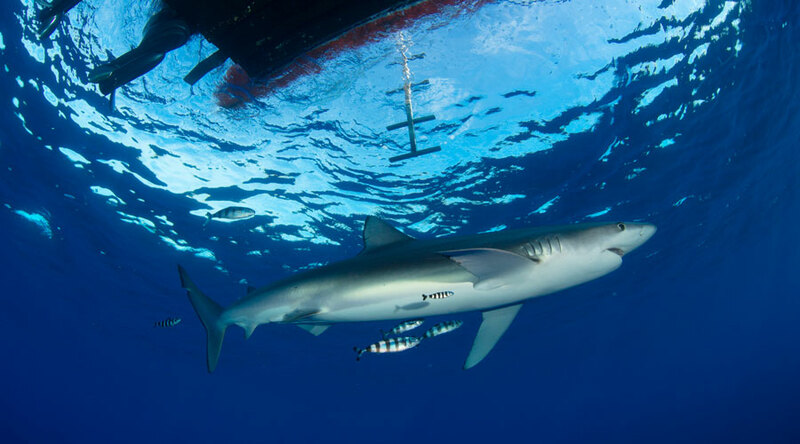 With the help of a controlled feeding system, the blue sharks come to visit boats, and are encountered under the boat in only 2-5m. 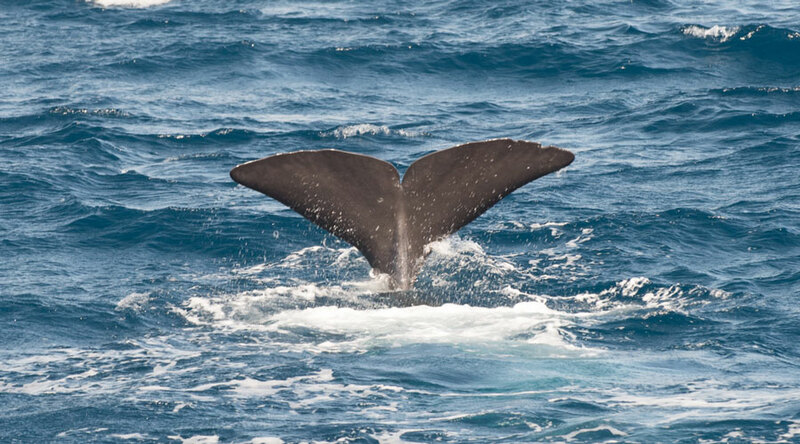 These are typically larger than their Cornish counterparts and to be in the water with them on scuba is thrilling. 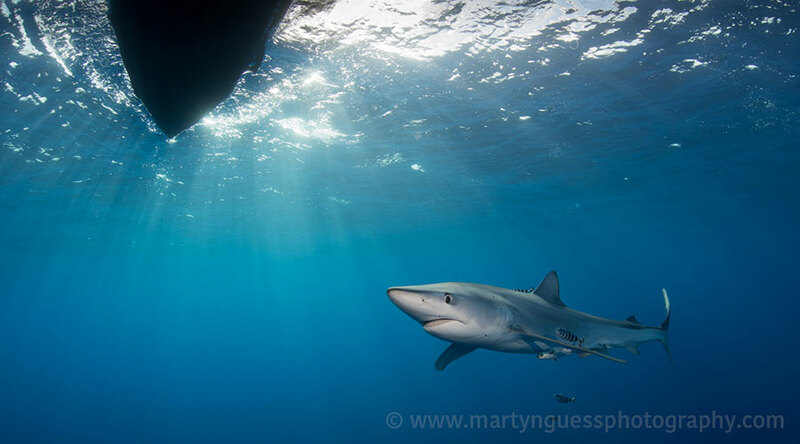 The contrast with the sunshine filtering through the water and the bright blue surface of the sharks is photographic perfection. Photographers will be split into groups with no more than 4 divers in the water at any one time. Each group will cycle round to ensure everyone has a chance to take shots without excessive bubbles or divers disturbing the action. Divers must maintain contact with a shot line at all times as you will be in blue water. 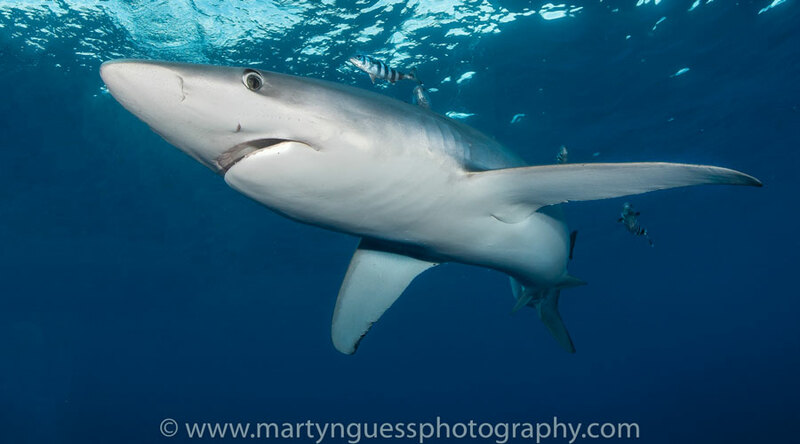 Martyn will be on hand with a host of tips as to manage the photographic opportunities, dealing with the surface conditions and shark exposure. You can use strobes or not, but we ask that you have gloves and a hood. Previous experience shows us that afternoon sessions have had the best encounters. The dive centre build on their years of diving with blues to attract them. 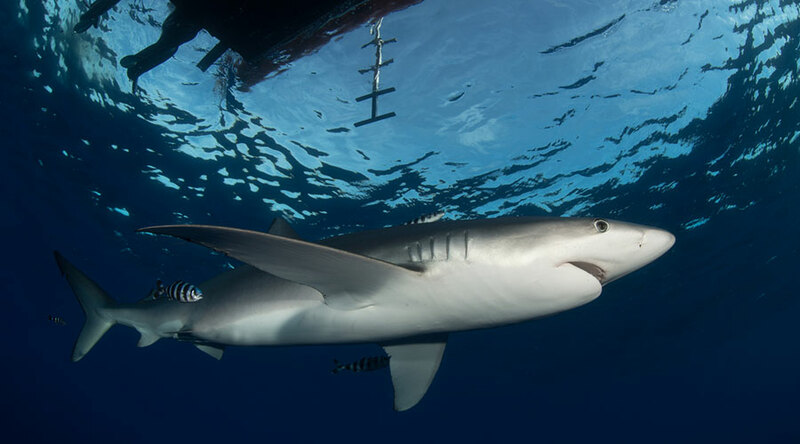 Some sharks have been tagged by the local conservation teams, and this data is fed back to the dive centres. Local operators work together for the best sightings. However, we cannot guarantee sharks and it may take time in a session before they put in an appearance. 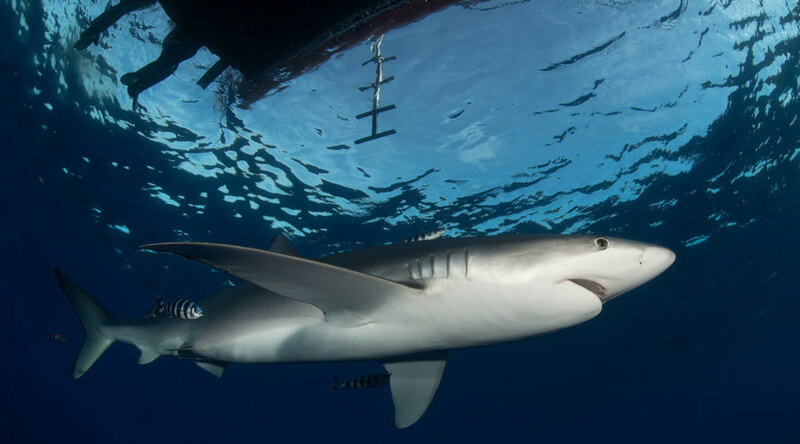 There will be at least 3 separate sorties out to the blue shark sites during the trip. This workshop includes 1 day at Princess Alice Banks (2 dives). The reef in the Azores is based on volcanic rock. It is as dramatic under the water as it is land side. Martyn has selected a range of wide angle and macro sites that will not only be photographically rewarding, but also give a good taster of diving in the Azores. The Azores is the only land fall for miles around, and as such, it is buzzing with bio diversity. Several sites offer the perfect combo of shallow, easy diving with large schools of bream, trigger fish and snapper. Several types of moray are found hiding under rocks. Look even more closely and you can find octopus. 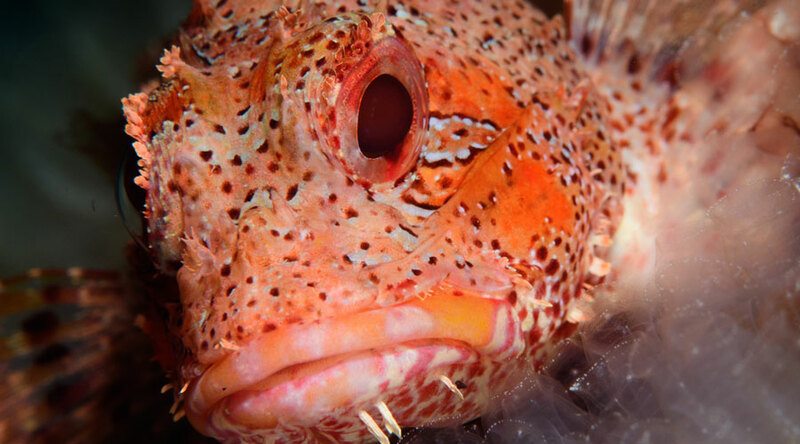 There are scorpion fish, groupers and parrot fish. Several species are endemic to this region - there's a particularly cute putter fish to look out for. The most exciting wide angle sites centred around cavern dives. Huge gaping caverns open out from the reef face to the sea. Massive schools of tiny silver bait fish swirl around the openings. Small eagle rays dark in and out of the cave itself. This is a great chance to work your wide angle skills and lighting techniques. with the contrasting dark and light and a well placed model as your subject. This workshop includes 3 reef dives. No visit to the Azores is complete without experiencing some of the land life. A morning spent on the whale watching boat has been included. 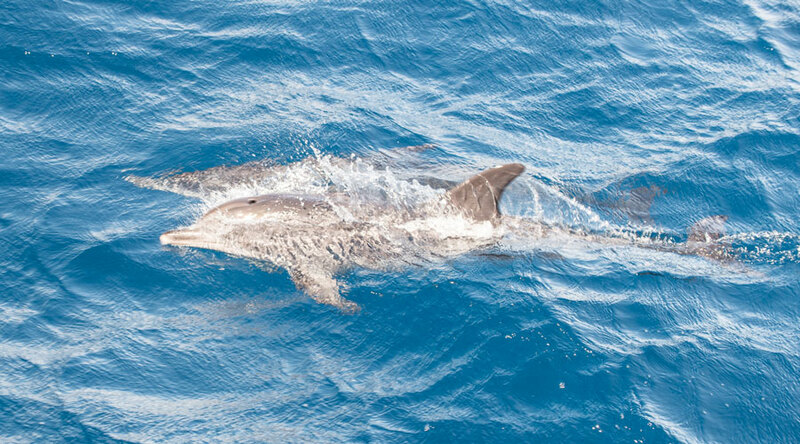 In September, you can expect to see sperm whales and dolphins. A long lens and fast shutter speed is helpful! Your experience is on board a catamaran and includes a full briefing about what to expect. The Pico Volcano is an impressive sight, and visible from your hotel and the pier front. The clouds around the peak are forever changing and the light around sunrise and sunset is especially spectacular. 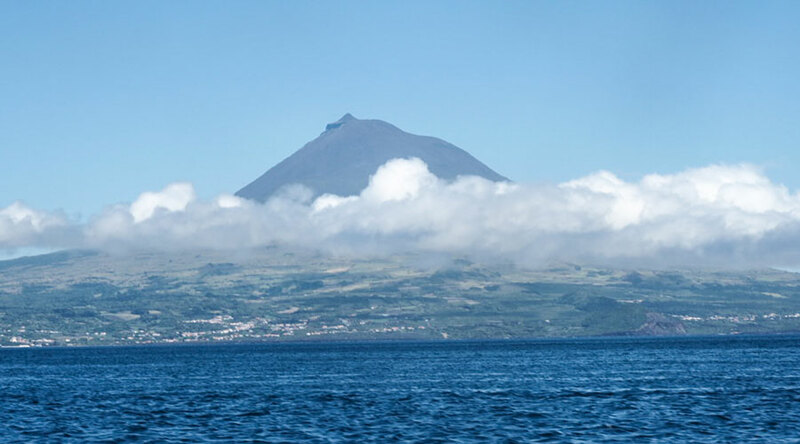 We have included a tour of Pico island on the final day when no more diving can be done. This is a chance to view the volcano upclose - the hike is accessible and takes around 2-3 hours. Pico is also famous for white wine, and a wine tasting tour wraps up this special final day. International flights route via Lisbon, and will arrive into Horta airport on Faial island. Excess baggage on TAP airlines can be prebooked after ticketing, but is not included in your flight booking. 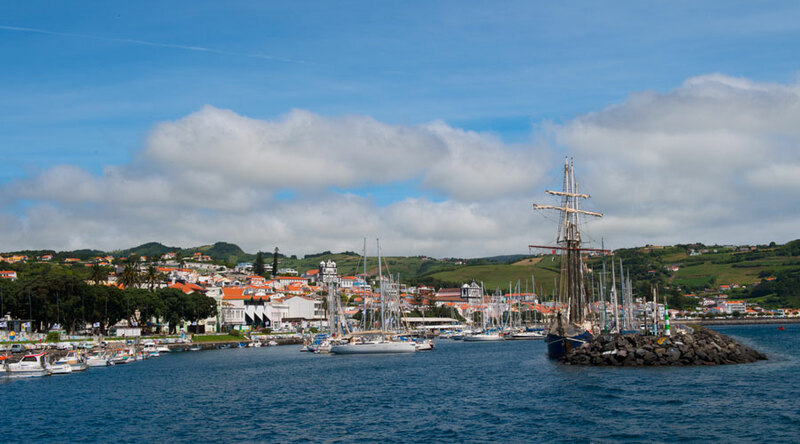 UK passport holders do not need a visa for travel to the Azores. You are then only a short 15 minute transfer from Horta centre, where the hotel do Canal is located. On arrival at Horta airport you will pick up your luggage and proceed outside for your transfer to the hotel. This takes around 15mins. 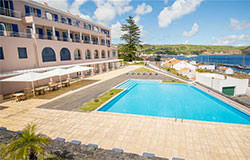 You have 8 nights booked at the Hotel Faial on a B&B basis (2 people sharing) in a standard room. You will be advised of the pick up time the following morning to begin your diving. A picnic box lunch will be provided on diving days. The dive centre will make dinner reservations for the group in advance - these are not mandatory, but we highly recommend experiencing the excellent cuisine of Faial island. Martyn will be giving presentations throughout the workshop, as well as opportunity for 1:1 work on any aspect of the photography covered. 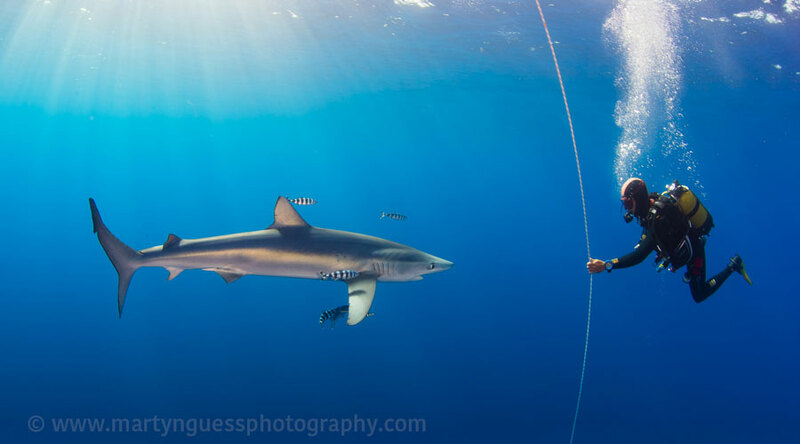 This workshop has been timed for the optimum chances to meet blue sharks in shallow water. 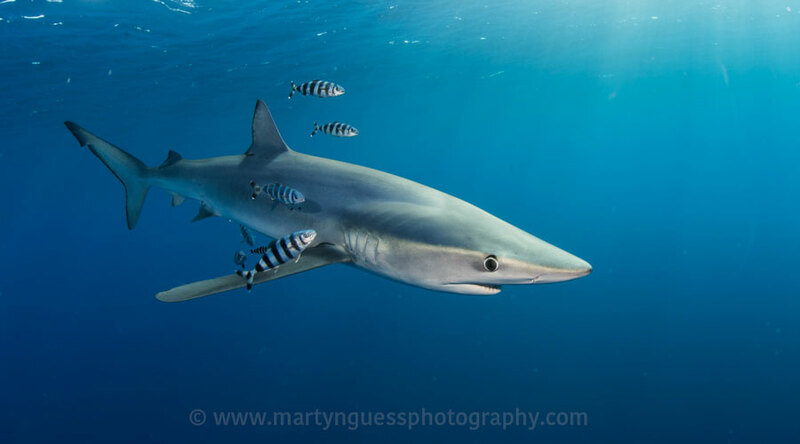 There are 3 full dedicated Blue shark trips, as well as 8 dives to hand picked wide angle or macro sites. A full day diving at the famous mobula hang out Princess Alice Banks is also included. 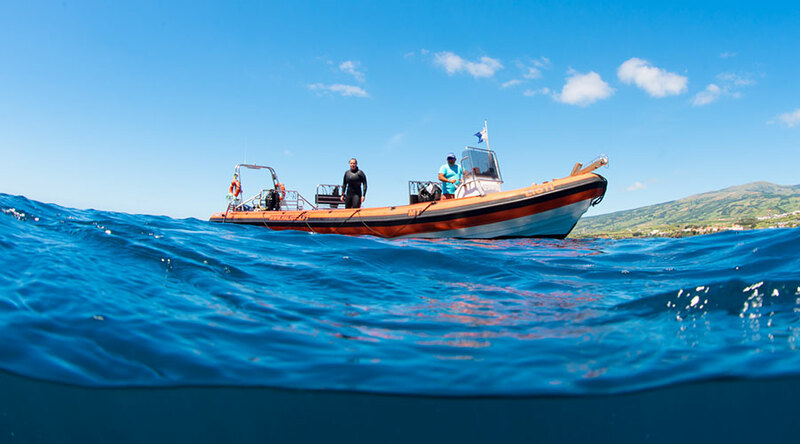 This day is weather dependent and if the RIB cannot make it to this remote, offshore location, an alternative day diving will be arranged instead (additional blue shark/reef diving). Depending on the dive option a refund of the difference will be calculated and reimbursed on your return to the UK. There will be a morning spent whale and dolphin watching, and the final desat day will be spent on a tour of Pico island with wine tasting. This is a dedicated photo group with full access to the large RIB for diving. At the end of your trip your return transfers to the airport will be advised locally.